Home › Uncategorized › Welcome to the new Website! It has been a long time coming, but the new website is finally here. I am sure there will be a few kinks to workout so if you see anything please let us know by filling out the contact form here: Contact Us. We are really excited to finally have this new site up and running and we wanted to take you through some of the features of the site. Subscribe to the Mailing List – We send out notices for our meetings and also select local events that you might be interested in. We do not send out any spam, allow for sales emails or share this list. We hate those things too, so we would not do that to you. Join our Meetup Group – We post our meetings here as well. This is a great way for others to discover our events and for you to share events with your colleagues. Joining the Meetup is Free. Sign up for Membership – We are all-volunteer, non-profit group and we are able to provide all of this for FREE due to the support of our members. Are you getting value from the User Group? Maybe you can support us with a Membership? View Jobs – On this page you can view all the jobs available. You can also filter your job search by location, keywords, or type of job. Lastly, with any search you can click on the “RSS” link to get a RSS Feed of jobs based on your search criteria. So you can now be notified of new jobs. Submit Jobs – No account is needed to post a Job. Just click on the link to submit a job. The job will then be reviewed by an administrator before it will be posted. Once approved a job listing will be active for 45 days after which it will expire. 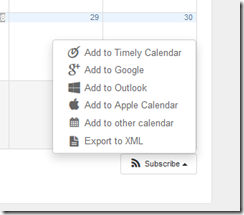 The calendar (Link) is your one stop shop for all User Group and Community Events. With the new calendar that are even new ways to get updates because you can subscribe to a feed of events directly in your favorite calendar app. 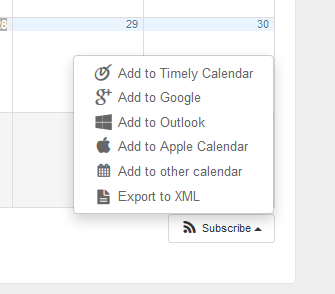 At the bottom of the calendar there is menu to subscribe the calendar in either Timely, Google, Outlook, Apple, Other (iCal), or XML. We will keep the calendar to to date with all the events you need to know. We have information pages on all the groups under the .Net User Group umbrella. You can check out pages for each of the groups to get information on when they meet, where they meet and how to engage with each of the groups. Get information about our Memberships and signup for Membership. Our group is only success because of the support of our members! Thank You! Want to keep up to date on what is going on with the User Group? Subscribe to our Blog Here. We will be posting entries on our upcoming meetings, special deals from our supporters, upcoming community events, and information we think you might find helpful. We have many supporters of the User Group the either provide space for our meetings, hosting for our website, or raffle prizes for our meetings. We want to say Thank You to those supporters. If you come across them, be sure to say thank for supporting the San Diego .Net User Group. Do you know of a company that would be interested in supporting us? Let us know via the Contact Us form. We hope you enjoyed this tour through our new website. We hope you enjoy it and it you have any thoughts, ideas, improvements, etc., please be sure to let us know via the Contact Us Form.